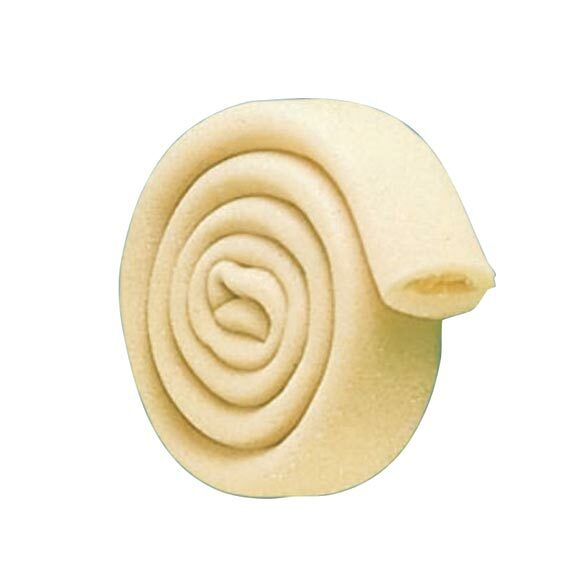 Slip-on tubular bandage protects cuts, bruises, corns, and blisters with soft foam lined in breathable cotton gauze. Trim tube bandage to fit. Relied on by doctors, now available to the public. Small 5/8" fits children and little fingers; Medium is 3/4"; Large, 1". Each is 36"L.
I use this for comfort when bulkier "strap down" hammer toe devices won't fit in my shoes or boots. Protects toes from pain of corns and other sore spots. Shoes don't rub new spots on protected toes unless shoes are definitely too narrow. Are washable and can be mostly reshaped to original shape to last longer. I wanted the tubular bandage to use on my toes to separate them and protect from sores. I DID order the wrong size for my needs, which is my fault. I had to cut it down to size for my toes. I used cloth tape to piece it together and it works well. They do come off during the night,so I put a piece of tape at the base to keep them on and don't have to search in the bedsheets...:-) They have a very weird chemical smell. I put it in my cabinet and could still smell it upon entering the bathroom, so I sealed it in a plastic bag. Husband needs to put over bunion growth on finger to assist when he is writing and using that hand. i have been using these for a year and they work o k.
Dr says using them would help my toe problem. Originally given to me by a doctor, rolls of the tubular toe bandages were not available locally. Easy comforst offered what I needed via the Internet. Price. Will purchase again if they work. sock seams making toe tops sore when I work out. I have used this before and it gives me comfort. Having a problem with both "big toes," and this product, which I have been using for some time, provides the comfort I need inside my shoes. Simply a great product! BEST ANSWER: Hi The tubing is 36 inches and I have used it many times since I first bought. I customize each time I use it. Is this an inside or outside dimension? BEST ANSWER: Thank you for your question. It is the inside dimension for the measurements. We hope this information will be of help to you. Do you have these tubbular bandages for the legs too? I want medium size where do I put in order ? BEST ANSWER: Thank you for your question. You can use the drop down menu to select the size. We hope this information will be of help to you. what size is for toes, sm, med or large ? BEST ANSWER: Thank you for your question. The small is 5/8", Medium is 3/4" and the large is 1". Depending on the size of your toes, the small or medium works, while the large is usually for your big toe and thumb. We hope this information will be of help to you.